Over the years the names of many individual people have added colour to the Australian English vocabulary. The technical term for words deriving from people’s names is eponym (from the Greek epi ‘upon’ + onoma ‘name’). Eponymous people in Australian English include Anna Pavlova (ballerina), Barry Crocker (actor and singer), Baron Lamington (Governor of Queensland ), Ned Kelly (bushranger), Dame Nellie Melba (singer), Dorothy Dix (journalist), Sylvanus Bowser (inventor), Maria ‘Granny’ Smith (gardener), Reginald Grundy (television producer), and Harold Holt (Prime Minister) to name a few. * One of the more recent names we can add to this list is former Australian Olympian Steven Bradbury. So what did the original Bradbury do to achieve his place in the Australian lexicon? 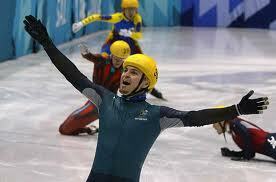 In an unlikely series of events, short-track speed skater Steven Bradbury became the first Australian to win a gold medal at a Winter Olympics. In Salt Lake City in 2002 he competed in the thousand-metre short-track event. After winning his first heat it seemed that his chances of progressing any further were slim – his quarter-final draw included two of the world’s best skaters, and only first and second placegetters would progress to the semi-final. Bradbury finished third, but one of the other placegetters was disqualified for obstruction, thus giving the Australian a spot in the semi-final. In the semi-final race he was at the back of the pack. It looked as if he was out of the race, but when three other skaters fell he managed to finish second and secured a berth in the final. Five skaters took part in the final race. Bradbury was last in the pack, when, in spectacular style, the other four skaters crashed and fell on the last corner. Bradbury passed the pileup and took the gold. An Australian legend was born and the term ‘to do a Bradbury’ was very quickly established in the Australian vernacular, and continues to be used to this day. * To find out about the eponyms formed from these names and others check out an earlier article from our newsletter: When People Become Words, Ozwords, October 2005. This entry was posted in eponym, etymology, sport and tagged do a Bradbury by Mark Gwynn. Bookmark the permalink.